Earlier this month, I was on a judging panel for the Professional Driver awards, which saw more than 100 participants driving a selection of new cars aimed at the chauffeur and taxi world. Around 60 of the latest models were assembled at Sandown Park racecourse, and each of them appraised as to their suitability for the job in hand. While many vehicles sat idle for periods during the day, the Kia Stinger was constantly out, with each judge keen to get behind the wheel. Thatís impressive considering that the South Korean car was parked alongside delights from Audi, BMW, Jaguar and Mercedes-Benz, as well as a range of less glamorous brands. Each driver came back enthusing about the Kia, with a grin from ear-to-ear, which bodes well when the marks are totted up later this month. And that Cheshire Cat-like look sums up my time with the Stinger, as itís a real pleaser. Not only do you feel fantastic driving it, but it really gets noticed. People stop and stare in the street, and thereís few cars that manage that these days. Iíve lost count of the number of conversations that have been struck up in car parks, with passers by keen to find out more. If that interest translates into footfall into Kia showrooms, then itíll be a case of job done. 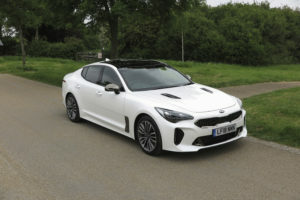 Bosses at Kiaís headquarters in Walton, Surrey donít expect to shift huge numbers of the Stinger, but instead it works as a halo model, giving the entire model range a lift. One of the colours that you can specify on all Stingers is Sunset Yellow, and it was a contender when I was specifying my car. But because I wanted red leather upholstery, I didnít think it would go together very well, so I opted for Pearl White instead. I spotted a pair of Stingers in the shocking yellow shade in a public car park last week, and it turned out that they were cars that have been loaned by Kia to Surrey County Cricket as part of the sponsorship deal with the Oval. Iím actually quite pleased that I didnít opt for the hue, as itís a bit ëin yer faceí. Throughout the heatwave season, Iíve made plenty of use of the ventilated front seats. Lovely jets of chilled air coming from the carís chairs cool you down nicely, especially if youíre wearing shorts. Combined with the effective dual-zone climate control system, itís only a matter of minutes until the cabin of the Stinger is akin to the chiller cabinet of the local supermarket. Other features I love are the flat-bottomed steering wheel which helps getting in and out of the low-slung sports car, and the wireless charging mat that adds juice to your smartphone without any messy wires. The helicopter view of the camera system is awesome, too, making shuffling around in tight spaces as easy as anything. I love the key. It’s funkier and more upmarket than other Kia keys. The dark chrome door mirrors seem to be a magnet for the bugs and other marks that mar the appearance.